the jewkes: To bink or not to bink, that is the question. To bink or not to bink, that is the question. 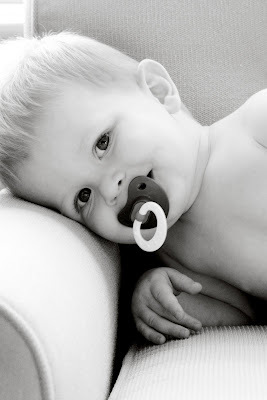 I have a love/hate relationship with Zander's Binky ("Beets" as it is known around our house). Zander could be having a full on melt down and once that sucker goes in his mouth he is instantly lulled into a coma and starts twirling his hair and rubbing his eyebrows (the things kids do to soothe themselves). In all honesty, I wish that he could have it forever. It would make life so much easier for me, but I think it would be a little weird having him pull it out of his pocket on a date when he got nervous. Any girl worth having would understand! I say let him have it until he is old enough to understand leaving it under his pillow for the "Beets Fairy". I have seen and heard him in the full on melt down. I think it is a fair trade off... keep the binks and keep your sanity! I was so worried about that with Eli too, but then, after we started letting him cry during his naps and before bedtime, be started refusing it. One day I put it in and he spit it back out, he hasn't used one since, I don't envy you, but I say, whatever. So you have one little tiff with him, if he is otherwise perfect (and I just KNOW he is...) Count your lucky stars. I don't think it's fair that we have to take away the one thing that can soothe them like nothing else can just because "society" doesn't approve! oh jesi,, i cant stop lauging. I have tears in my eyes and I know exactly what your talking about,, I say go with the bink for a while longer,, he will get rid of it on his own,, but im just a mother in law so what do i know. and ... Im a push over,, ha ha,, remember Paul had a bink too and he didnt have it with him on your fist date.or did he??? I have a friend who just cuts off a tiny peice of the end but lets the kid have it. then about once a week she just cuts off another little piece until they just kind of look at it and think that thing is stupid. I dunno...just something to try. I think then they just wean themselves cuz it is not so great anymore. Me...My kid just lost interest this month (9 months old)and i am wishing that he would still take it. I keep trying to force it on him. No luck. I'm with everyone else. My mom always said that it was sad to take away things like Binky's and Bottles right at a certain age just because we "should". Let him have it until it really is becoming a problem, like everything else with kids, you just kind of know when. I like sadies idea.. ha ha. that is a funny one.